Well...there are worse ways to spend a rainy day! It was about a 30-minute train ride from the heart of Paris to the Versailles Rive Gauche station that puts you within a few blocks walk to Chateau de Versailles. Late February is the off-season and I was hoping the gray clouds would help keep the crowds down and since there was no waiting...the crowds were small...but many of the walking areas are tight so even a few people make the spaces crowded. I absolutely cannot imagine navigating the interior areas during the high tourist season. Upon entering the chateau you are forced to follow a one-way route through the rooms open for viewing. As I have already mentioned, these areas were tight and I was reading a description of the rooms off my Kindle from a Rick Steves guide book so I didn't even attempt many interior photos. Most of the rooms were rather dark. But it was magnificent. We had lunch at a lovely, but expensive restaurant in the chateau, Salon de Thé Angelina's. It was a great spot to sit and relax, half way through the interior tour, and somehow we managed to time our lunch break right before everyone else decided to join us! After lunch the crowd had thinned out. Our first stop was the Gallery of Battles. Versailles is now a museum of French history. 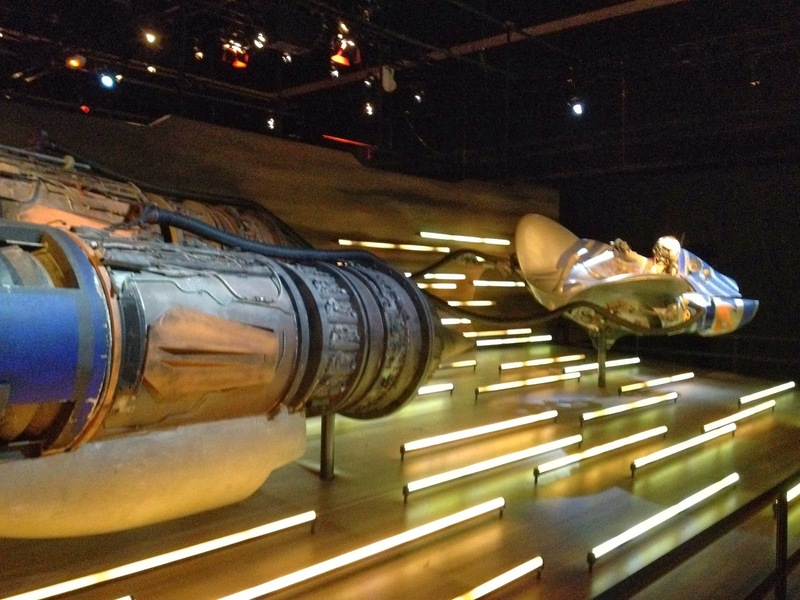 This space is very like the feeling of the Louvre. The Battles Gallery has 33 almost life-sized paintings of the main battles of France from 496 to 1809. There was a tribute to the French involvement in the American Revolution with this portrait of the Battle of York...can you spot George Washington? Here are a couple of other interior shots that I took that give you a feel for the rooms the royal families inhabited. These are from the apartments of the Dauphin...or heir apparent and Mesdames' Apartments, the six daughters of Louis the XV. The Chamber of the Empress. One of the oddest parts to bed chambers were the balustrades that separated the bed area from the rest of the room. I read that most of the spaces in the chateau were open to everyone so I guess that little fence was needed for some personal space. When we came upon this room, the bright colors were a welcome site on such a dreary day. Versailles should be a two-day visit. It was exhausting to fight the crowds in the chateau and the size of the garden is daunting. Here's the main view of the garden with the canals in the distance. There was once a little Venice out there with gondolas. I will have to go back to see the gardens when they are in bloom and the fountains are working. I read there are 300 fountains remaining from the 1,500 that were originally built. All of the statues were covered up to protect them from the winter elements. We had moments of warm sunshine but most of the day was gray with showers now and then to include a little hail storm. We never made it to the little village Marie Antoinette had erected in a corner of the garden...we were too tired of dodging the rain and our legs were ready to give out...despite a break at a café in the heart of the garden. The last two days my guests have mostly run around Paris without me. I had the final French visa appointment today so I'm good until next year. I caught up on laundry and got a little sewing done. The good news is my borders for the storm-at-sea quilt are coming along swimmingly. I need to measure the lengths...I might be crying later! The fabric I ordered from the US that my son brought in his suitcase is not the fabric I need! It is so hard to tell on the internet. 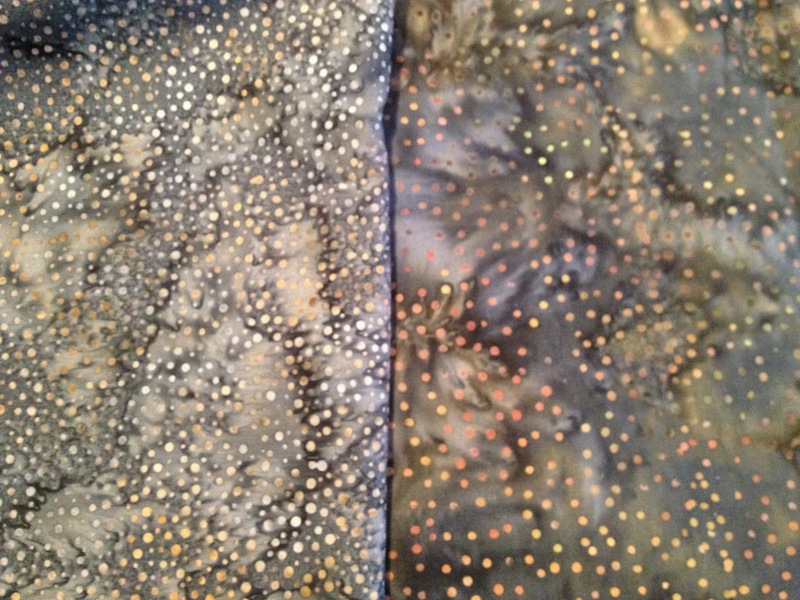 The fabric I need is on the right and I now think it is an Island Batik, 40-b3. What I ordered is a great Hoffman batik that is Smoke 885. I have seven quilt shops within an hour's drive from my Alaska home that carry lots of batiks...including the shop I bought this at (Dina's Cozy Cabin Quilts.) Maybe there will be some left in the area when I get home in May. If you are in a quilt shop with batiks...give a look for this Island Batik. It is really a charcoal colored background. I need two yards to finish my border but I would love to get four yards for some pillows. I have scoured the internet...no luck. If all else fails I will go with a mottled black without dots. I did have time to work on some cross stitching in the car and on the train this week and finished up three more cross stitch ornaments. The background fabric is my missing Island Batik fabric...the colors look more true with the colorful ornaments on it. We did a quick visit to Notre Dame yesterday. I have to say...after seeing the cathedral in Koln, Germany...this seems rather small and simple. Here's a view from the backside. We were a bit rushed as it was nearing closing time so maybe we just didn't allow enough time to appreciate it. There were lots of great gargoyles on the exterior but the lateness in the day made photo taking not so good. 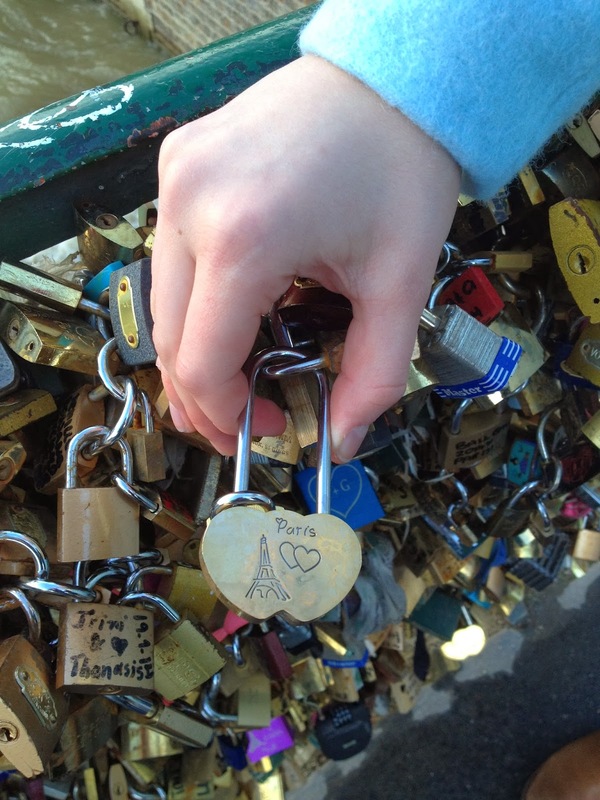 We walked across the "Lovelock" bridge, Pont de l'Archeveche. From the handrail to the ground, locks cover the sides of this bridge. Couples often have their names inscribed with a date on the locks...here's one you can buy in Paris to add to the masses. I read on Wikipedia that this is a recent fad. 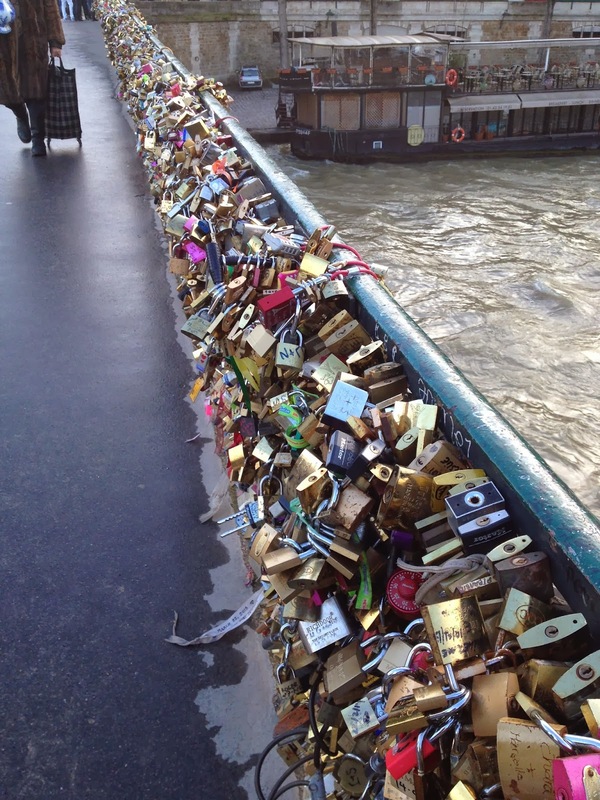 Around the year 2000, locks started showing up on bridges around Europe. It is a controversial practice. Many believe it is akin to vandalism on historic bridges. The dates we saw on the locks were mostly from the last four years...but it was unbelievably packed so I don't know how far back these locks are dated on this bridge. We then walked through the Latin Quarter...and yes...I should have taken some pictures but really...it wasn't very exciting. Little alley ways with small restaurants that aren't very good! I would advise to go anywhere else in Paris to eat...but it is very busy in the area so it pulled Zack and Lindsey in to eat there. We are planning a big day tomorrow and I will take lots of pictures. We are going to Versailles! 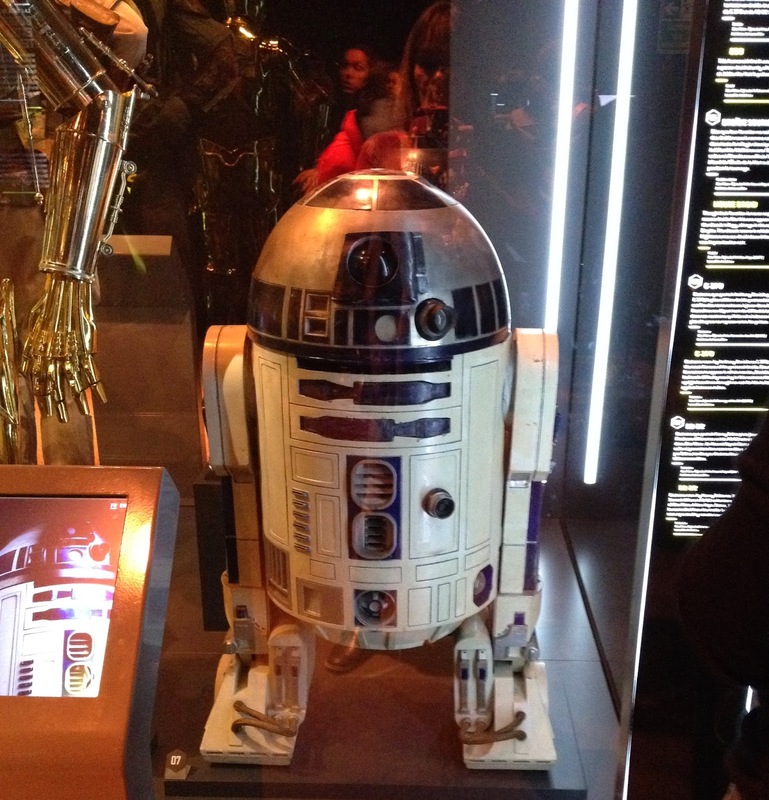 A Star Wars exhibition is making its way around Europe. It opened in Paris last week so we took part in it. 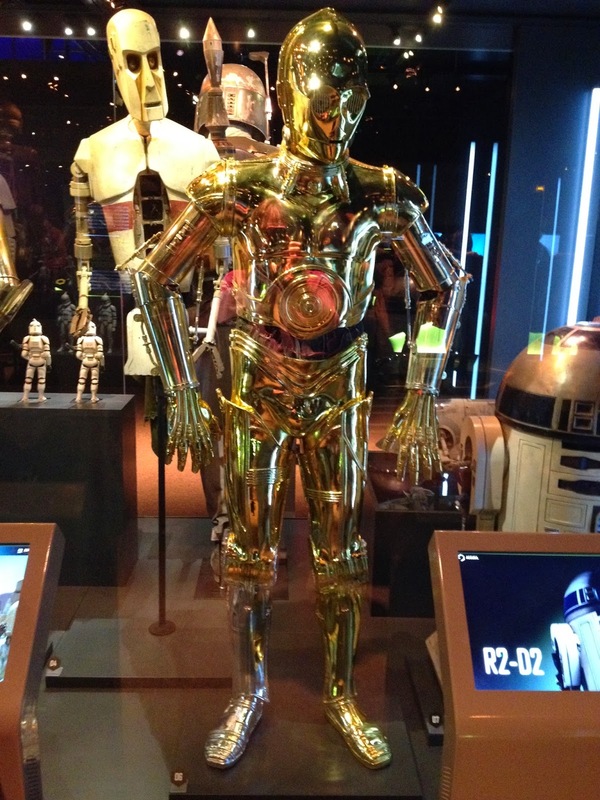 C3PO with his mismatched silver leg from the kneecap down. 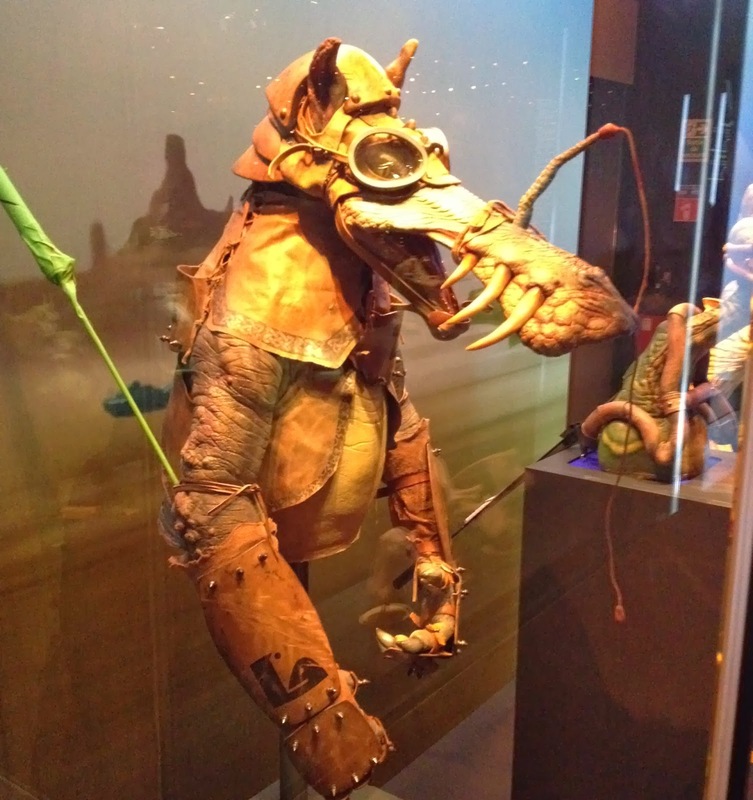 One of the pod racer puppets. No photos allowed in the two art museums we visited, musee de l'organerie and musee d'orsay. Our timing was incredible as it was the least crowded I had ever experienced in previous visits to these museums...despite it being a school vacation time here in Paris. We bought some macaroons from the famous Pierre Herme. A box of seven cookies was $18 Euros...very expensive...they were delicious but I'm not sure they are worth the price for a cookie just a little bit bigger than an Oreo. Here are the flavors as best as I can remember. My husband had an unexpected business trip to Koln, Germany so we jumped in the car and came with him. A pretty day but no shops were open on Sunday. And because I have another appointment on Wednesday to pick up my French visa, we are heading back to Paris via the train on Monday. Zack and Lindsey on a bridge across the Rhein overlooking Koln. We had some jaeger schnitzel last night with stewed red cabbage and sautéed potatoes and the locally brewed Kolsch beer. For lunch I had a great chicken curry. We decide to give Zack a break from art museums and instead went to a great museum in Koln with excavated Roman ruins found here in Koln...fascinating. Glass urns for cremated remains. 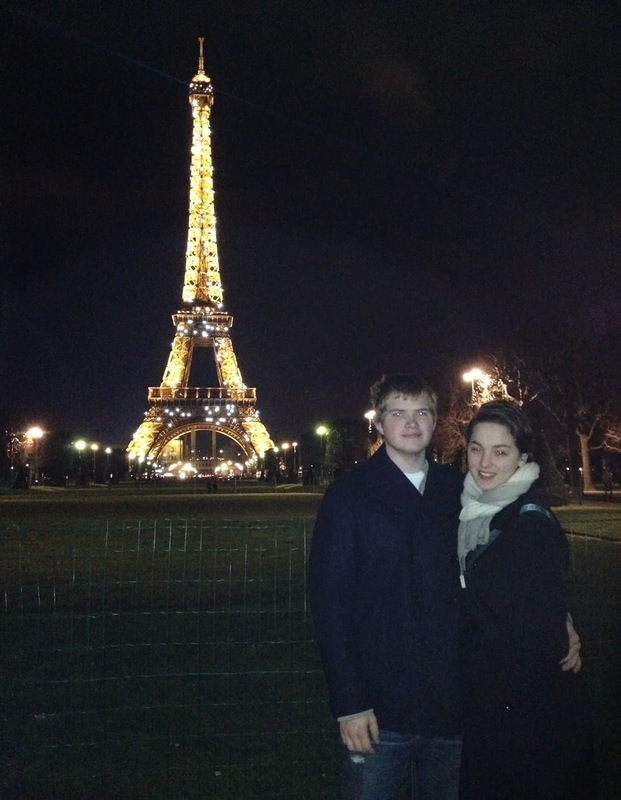 It is always fun on the first night we have visitors to take them on a walk to the Eiffel Tower. This is my son Zack with his girlfriend Lindsey. Since museums are closed on Monday or Tuesday we are doing some walking and shopping the first two days. 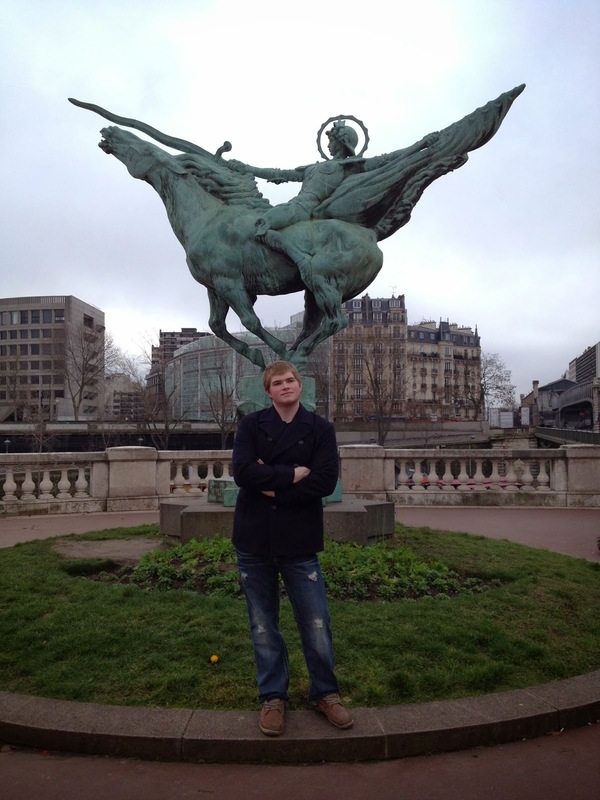 What's great about walking around Paris is all the artwork you can see along the way. Many of the bridges that cross the Seine have scupltures. And then there are the statues that you find here and there. Zack was striking a pose. 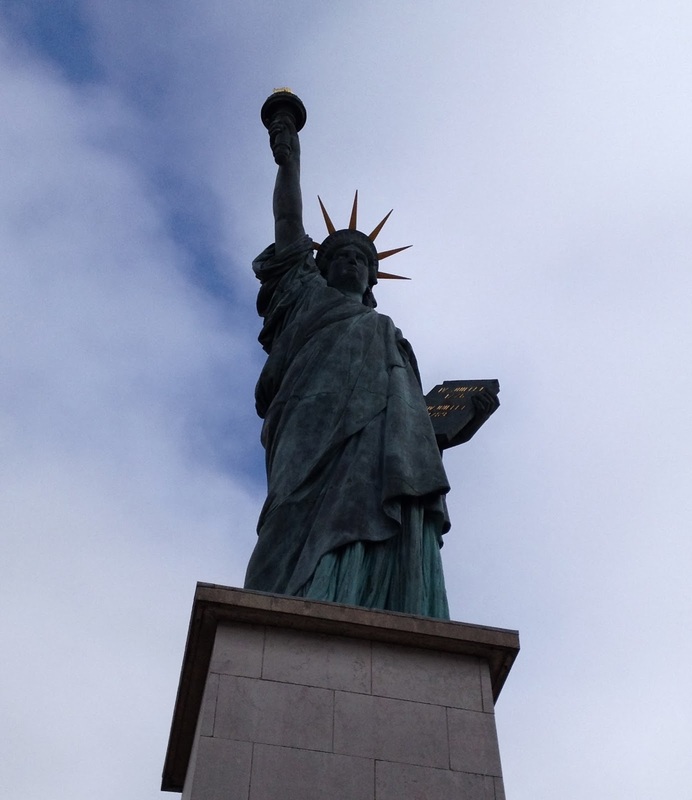 There is a mini Statue of Liberty which we had to check out. Another day of miles of walking is on the agenda for them. I am enjoying watching the Olympics...live. (Today's men's hockey game, USA vs Russia was great! Tied through the sudden death overtime and then went to an incredible shoot out!) 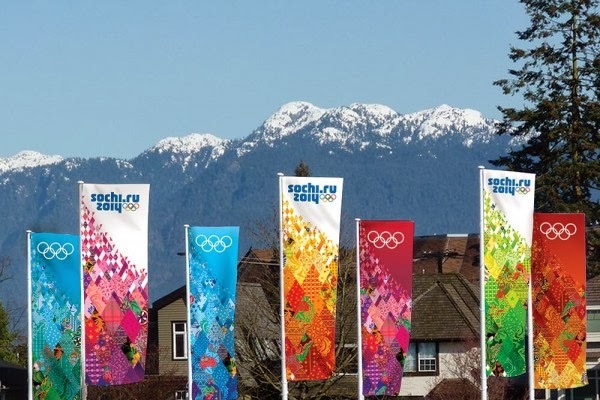 I can't take my eyes off the Sochi Olympic graphics because they are all a quilt motif. It puts one in the mood to quilt! I got up early to get to the Saturday market to buy my produce and then rewarded myself with the rest of the day spent getting borders cut out for one of my designs. Back to work on my version of storm-at-sea. 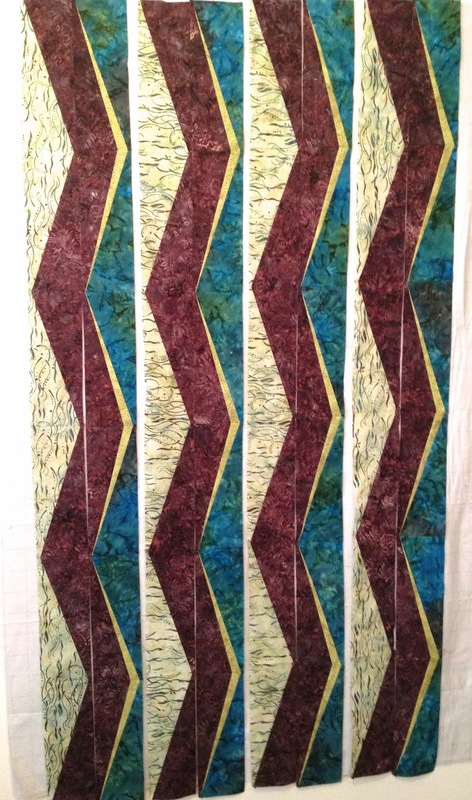 I changed my mind and had just enough fabric to go with the water-toned batik as the border. Love EQ7. Years ago when I started playing with this design I photographed my fabrics and loaded them into my fabric palette. Today it only took a few seconds to switch around the colors. This required some templates made from EQ7...almost takes all the math out of it but not quite. I did some taping to secure the templates in place while cutting. Worked great! Not sure when I will get around to sewing the borders because my son and his girlfriend get here tomorrow. I think we will find some fun things to do while they are here. We had a very relaxing trip to Lanzarote, one the Canary Islands off the west coast of north Africa. The internet stopped working about the fourth day so no blogging. We did lots of reading and sun worshipping. Here was one of our favorite spots to have a drink and grab a meal. Yep...right on the beach! Good food, great service and so cheap compared to Paris! Here was our rental car...look at the surrounding countryside. It was very arid and reminded us of west Texas. It is a volcanic island with very little vegetation. Still lots of black lava rock all over. Our rental car was only $120 for nine days...cheap! And of course we only used about half a tank of gas. We thought it was very funny the car color was "lava blue." Very fitting for our location. Here's my husband, Bryan, at my favorite restaurant on the island in the city of Teguise. I told Bryan with his new sunglasses he looks like Anthony Bourdain from the travel channel's, "No Reservations." 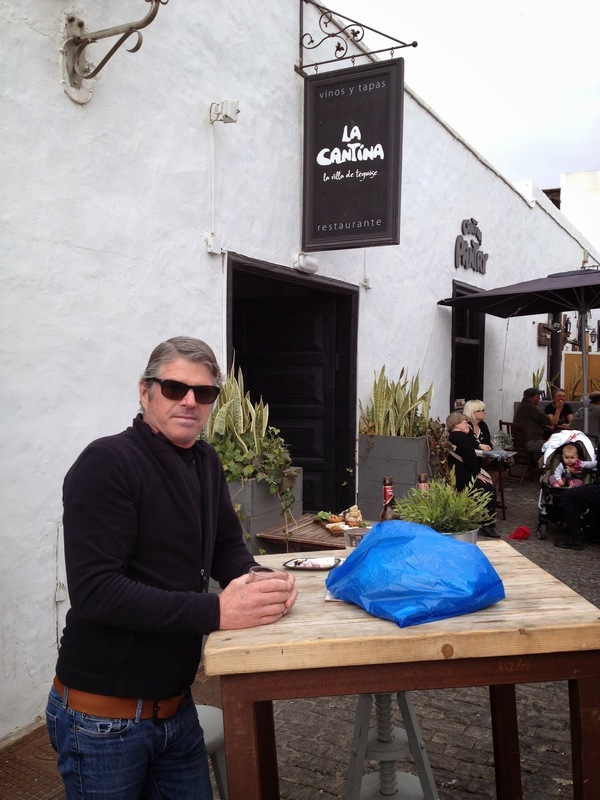 Here's what we had the first time we ate at La Cantina in Teguise. Bryan had a pork burger which he said was excellent. The fries were yummy. I had the most spectacular eggplant. Not a beautiful dish but so wonderful. I practically licked the bowl clean. The eggplant was lightly breaded and sautéed in a darkly rich tomato sauce. Just a sprinkle of cheese. So simple but perfectly done. 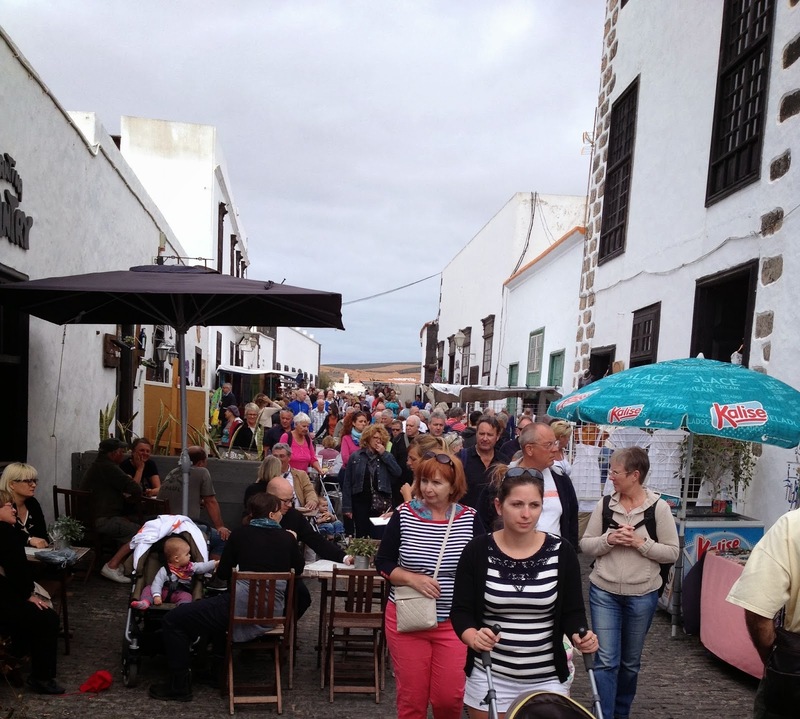 On Sunday there was an outdoor market at Teguise. I was surprised how big it was. 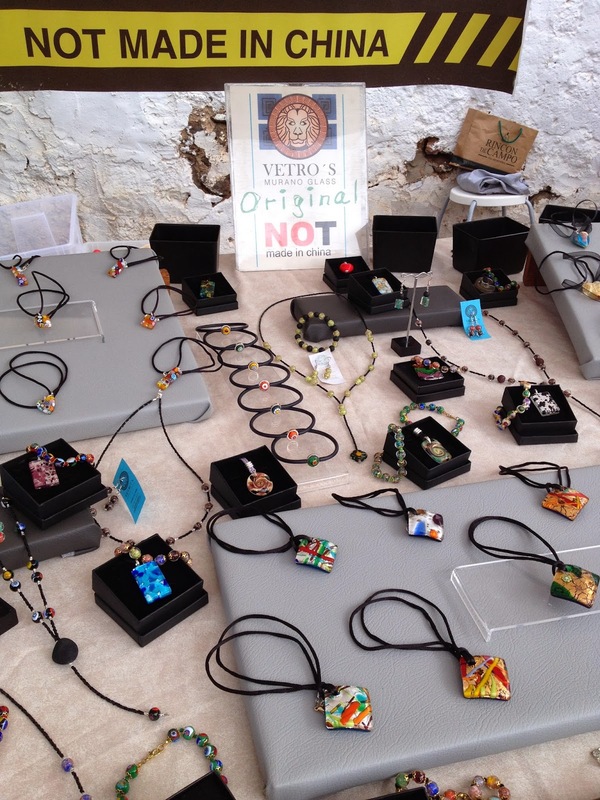 This is a very small section of the market. I love the "not made in China" sign. This was our villa. We had our own patio for sunning. Low humidity with temps in the high 60's. When the sun was out it was nice and warm but when the clouds covered it up it got chilly since the wind seemed to always be blowing. We stayed in a beach community called Charco Palo, predominantly a German vacation spot but we met a few Brits and Norwegians also. Pretty sure they don't get many Americans here. But most people spoke great English wherever we went on the island. 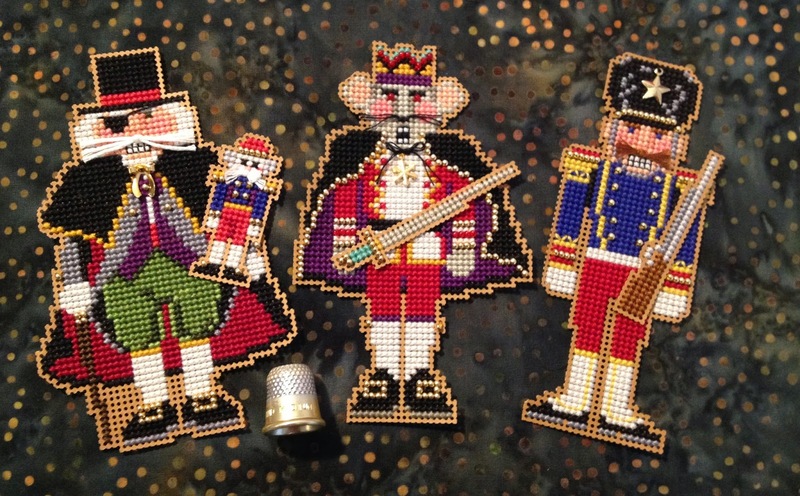 I did finish three nutcracker cross stitch ornaments. It was a wonderfully uneventful vacation until we landed at Orly airport in Paris. The taxi drivers were striking...again! And of course we didn't have the chauffeur service set up. A little too much excitement for 11 p.m. after a day of traveling. Oh...and Bryan bought a bottle of white and red wine from Lanzarote duty free which I put in our carryon bag with our three laptops. The bottle of white wine broke! Thank goodness two of the laptops had protective covers which soaked up the wine so all was well but that was not fun to discover when we were unloading from our flight. We caught a bus from the airport to a large train station that is only a twenty minute walk from our apartment. The weather was cooperating and for most of the walk we had a view of the brightly lit Eiffel Tower so we had a nice walk home which helped us work off our frustrations. We managed to get to our apartment by midnight. We are doing a whole lot of nothing! We are on the island, Lanzarote. I am language confused! They speak Spanish here...and I am better at Spanish than French but my mind is still spewing out a bit of French. Then there are also lots of Germans here so I feel compelled to throw out the 10 words I know in German now and then! Thank goodness, English is very commonly spoken here! Other than that...everyday is wonderfully quiet. We are taking a winter vacation to the Canary Islands. I decided to only take cross stitch projects since they are the easiest to pack. We will be gone for 10 days so I don't want to run out of things to keep me busy! I'm taking 12 ornaments and a little 5 x 7" picture project. A few years ago we went to Hawaii for two weeks and I finished nine cross stitch ornaments. It is always better to have too many. 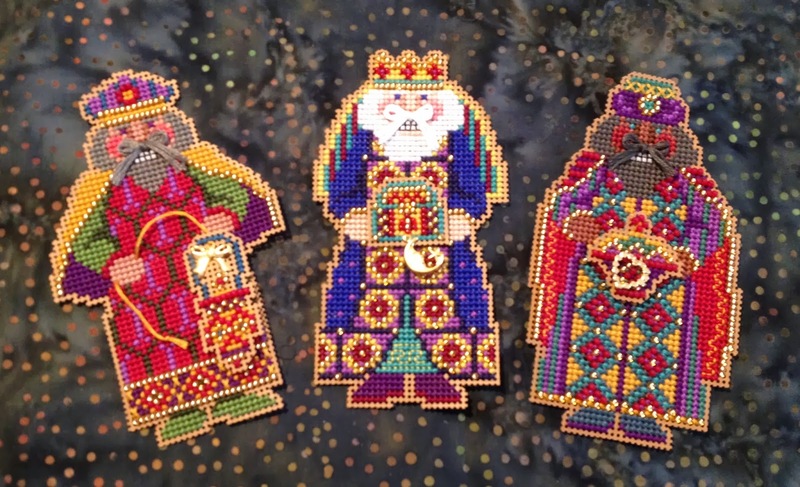 They all pack up nicely in my cross stitch kit. Very easy for me to pull out and work on during a flight. I have also been cleaning up the sewing room...getting ready for my return when I can tackle the borders on two quilts. I have been trimming my stash of scrap half-square-triangles. I have about 300 here...but they are from 2 1/2" strips which yields an odd sized square that is 1 3/4". 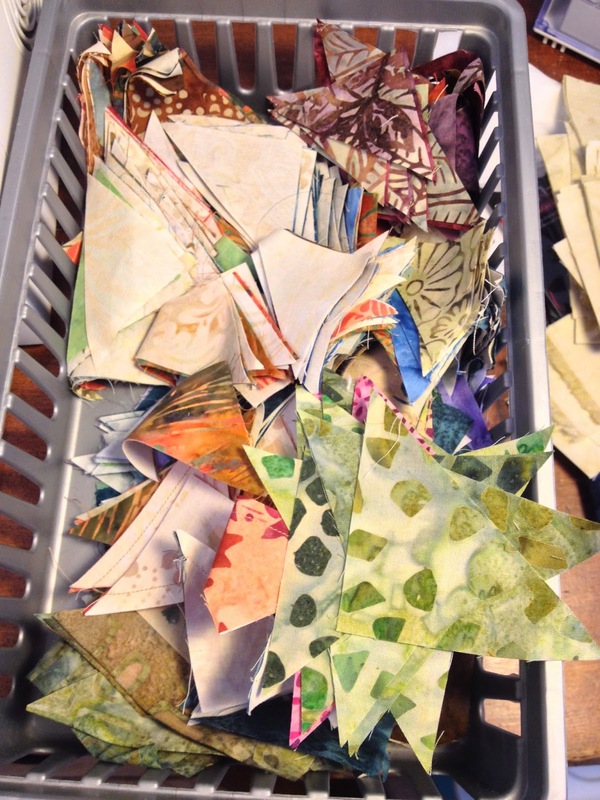 These all came from a king-sized quilt I made 5 our years ago and I've been hoping there would be enough HSTs to mix with the background fabric for two pillow shams...but...I left that background fabric in Alaska so I'll have to wait...again...to finish this one. At least I am getting caught up on the tiresome task of trimming these HSTs. 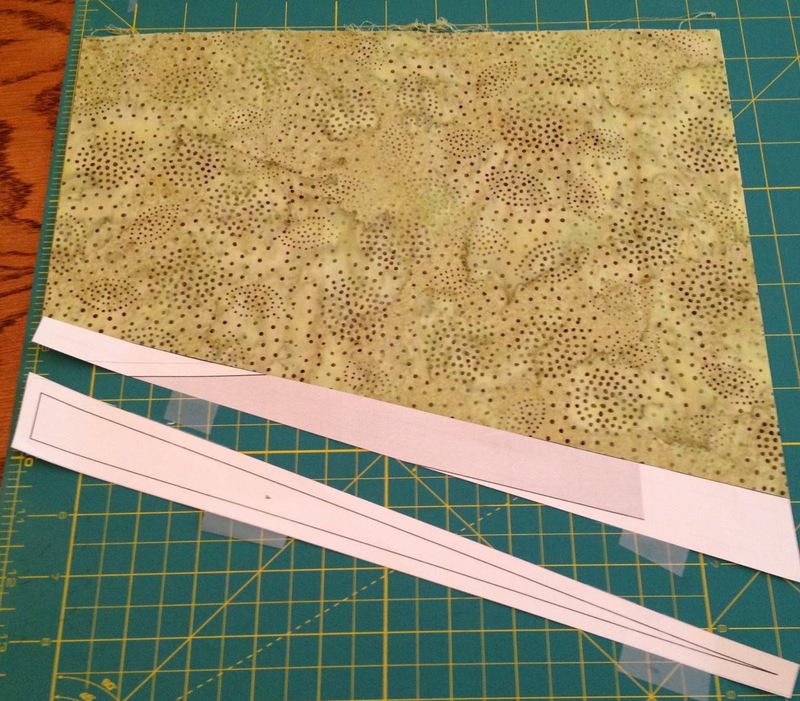 And I am always making more HSTs...this is my never-ending leader/ender project. And I wanted to show my cupcake ornaments after I "sculpted" them a little bit. I stitched through all layers, outlining the frosting and cupcake paper edge to give the ornaments a little more shape.